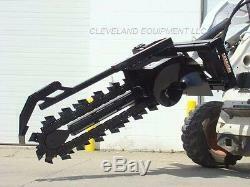 NEW PREMIER T150 TRENCHER ATTACHMENT. The powerful Premier T150 Trencher is engineered for exceptional visibility and structural strength. It features a heavy-duty Eaton Char-Lynn planetary gear reduction drive system that provides efficient and reliable power to the drive digging chain. 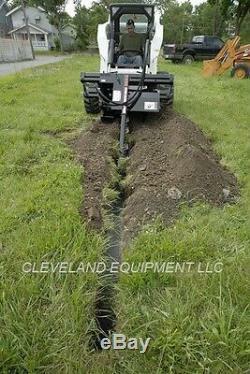 Most other trencher manufacturers use a chain and sprocket reduction or a direct drive system which require more maintenance and are not nearly as dependable. Direct drive systems put all the load and stress directly on the hydraulic motor, a design that typically leads to premature motor failure. Premier trenchers come equipped with replaceable spoil augers, which will mound most of the spoil to one side of the trench, and a built-in skid shoe to provide proper auger depth control. 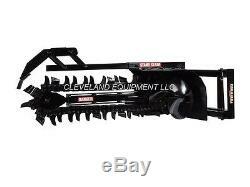 Manual side shift allows for closer trenching to structures, and a heavy-duty crumber shoe tool takes care of loose soil removal. 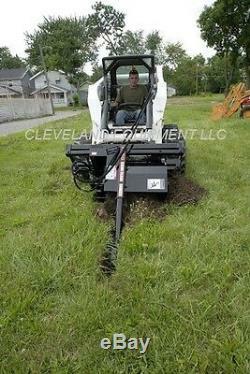 This Premier T150 trencher attachment features a 36" Boom with 6" Wide Double Chain. Fully assembled with covered Parker hoses, flat-faced couplers, and a durable powder coat finish. 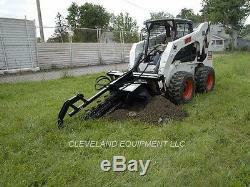 The universal quick-attach mount f. Its most skid steer / track loaders and tractors. Weight is 1,105 lbs. 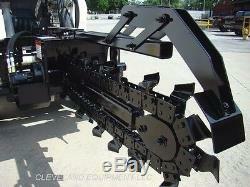 Additional boom lengths, widths, and chains available. 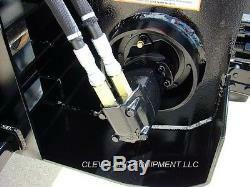 Heavy duty Eaton Char-Lynn planetary drive system. Boom Length: 36" - Double Chain Width: 6". Parker hoses & flat-faced couplers included. 15-25 GPM standard flow hydraulics. Built in skid shoe for depth control. Crumber tool for easy soil removal. Manual side shift comes standard. Optional 50/50 bullet tooth chain. Optional 50/50 shark tooth chain. 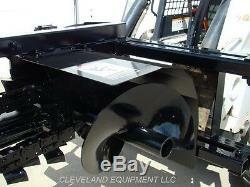 JOHN DEERE, EURO / GLOBAL, OLDER STYLES & VARIOUS OTHER ATTACH MOUNTS AVAILABLE! ONLY SMALLER ITEMS UNDER 70-LBS CAN BE PROCESSED AUTOMATICALLY. Call or write for our guaranteed lowest rate. If requesting quote by Message, please include zip / postal code. LOCAL PICK-UP / WILL CALL. With nearly two decades of experience and knowledge in the industry, we strive to provide great customer service and quality equipment at low wholesale pricing. 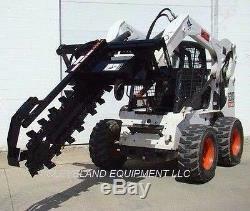 We only sell buckets and attachments from the industrys most trusted and well regarded manufacturers. WE DO NOT SELL JUNK! If you have any questions or doubts, please call or stop in and see for yourself. Message or call Jeff with questions at. 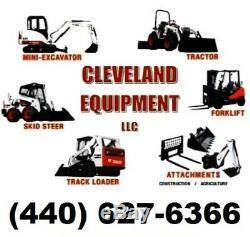 Fit the following brands of skid steer / track loader and compact tractors with universal quick-attach mounting plate. Store hours are Monday-Friday, 8:30am-5:30pm EST. Weekend hours by appointment only. 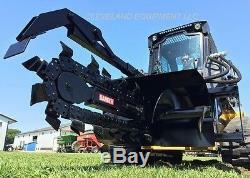 The item "NEW PREMIER T150 TRENCHER ATTACHMENT Skid Steer Loader John Deere New Holland nr" is in sale since Sunday, October 15, 2017. 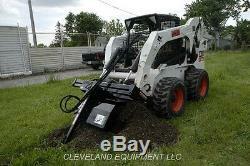 This item is in the category "Business & Industrial\Heavy Equipment, Parts & Attachments\Heavy Equipment Attachments\Other Heavy Equipment Attachments".